Thank you all for the birthday wishes! I've had a smile on my face for a few days and each little note is appreciated. It is so nice to be wished a happy birthday. Now, despite the fact that I am a person of modest means, I have been spending a lot of money lately (cf. the Nikon purchase I mentioned in the last post). 'Tis the season, etc. 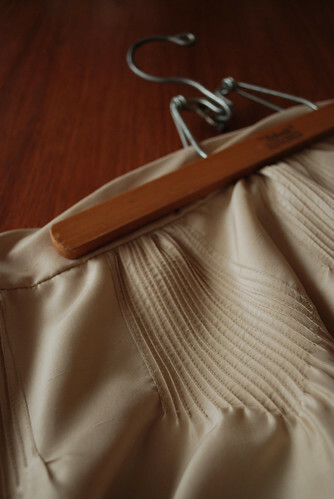 I am not usually the type of person to care too much about designer clothing -- I'll leave that for readers of Vogue -- but last week I got the most ridiculous deal on a beautiful silk skirt, and I couldn't leave it behind. Look at the pintucking on this beauty! It's maybe one size too big, but I make compromises sometimes. 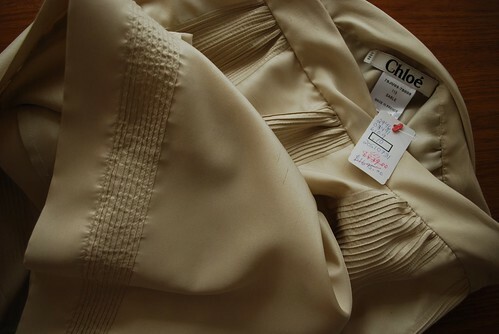 The last marked price on the skirt is $667; the final price was 90% off that. Thank you, Holt Renfrew Last Call. wow, that is an insanely amazing deal! The skirt is gorgeous. I've never had that sort of luck at Last Call. Happy Birthday! Your party looks like it was cozy and delightful, your new skirt is beyond lovely and I wish you a thirties full of happiness and good fortune. Yulanda (I love your name! ): I was actually pretty impressed with Last Call! I suppose a lot of the things there are from past seasons, but I wouldn't really know, so it's perfect for me. Maybe it's easier to find bigger sizes, haha. Stephanie: Thank you so much! I wish you the same for the coming year! April: I KNOW. Holt Renfrew is insane, although I'm not gonna lie: I totally wish I could shop there all the time, even if it's just to buy fancy face cream. Last Call is an outlet store, I think the only one of its kind. "End of the line." Ordinarily outlet stores depress me, though. it looks stunning! nice deal! i never have any luck with prime outlet stores - but finding a gem like this in one would certainly keep me coming back!